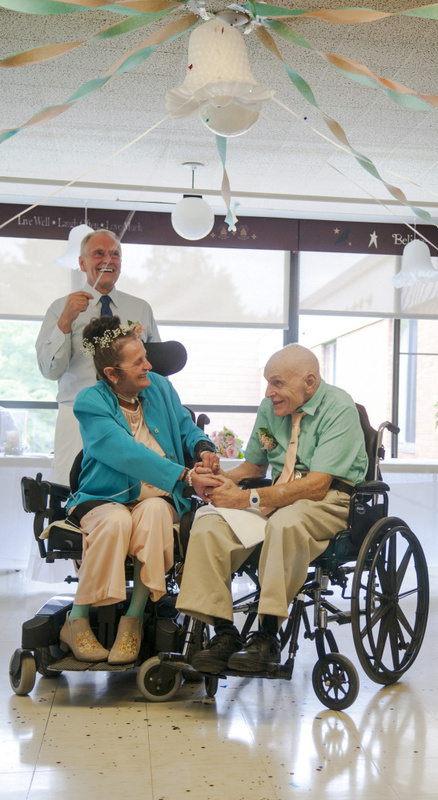 Sonya Trott, 75, and Bryant Brunye, 79, were married Saturday at long term care facility just six weeks after Brunye proposed. AUGUSTA — When Bryant Brunye asked Sonya Trott to marry him on July 8, the timing was spontaneous but the sentiment was not. Brunye had been thinking about it for a while, and it was just time. 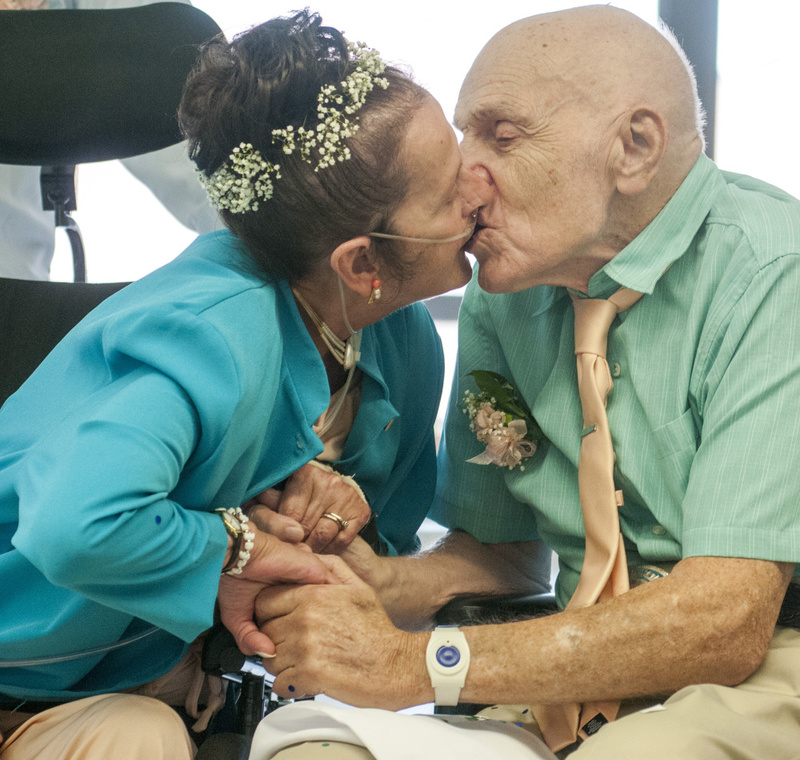 On Saturday, the two were wed in the community center of Gray Birch, MaineGeneral’s rehabilitation and long term care facility in Augusta. 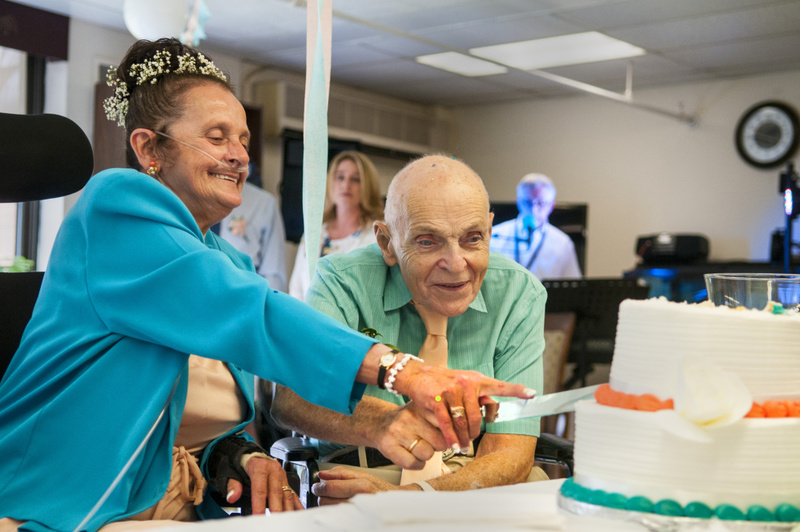 The Brunyes, Bryant, 79, and Sonya, 75, cut their cake, fed each other just a bite, tossed the bouquet and the garter and accepted the well wishes of friends and family. Their romance, observers say, bloomed slowly from friendship to something more. Bryant, originally from Connecticut, and Sonya, who is from Augusta, have known each other for a couple of years. They have been seen holding hands at lunch and at movies. They have gone on trips together. “It’s much better to travel with someone, particularly of this caliber,” Bryant said, looking over at his wife. On the day he proposed, he said, they were by themselves. “I said, ‘Marry me,'” he said, retelling the event in his quiet and deliberate way. Sonya said she was surprised. Bobbie Jo Welch, the activities director at the facility, was in her office when Sonya came in with the news. In doing so, the Brunyes have made a little history at Gray Birch. In the two decades that Welch has worked there, this is the first time a wedding has taken place between residents. In her memory, Welch said, only one other wedding has taken place, between a resident and a volunteer. With only six weeks, Sonya and her daughter went to work, along with Welch and Black, planning the wedding and getting everything done, from planning the menu and getting the marriage license to booking the entertainment and picking the colors. This is the second wedding for Sonya, and it was, she said, far more elaborate than her first. She chose the peach and aqua color scheme in honor of a late friend. Her friend was killed in a car crash and never made it to her wedding, Sonya said. For their wedding, they both wore those colors. In all, about 50 people were on hand to celebrate the day. They might take a trip, but that’s for later. On Saturday, the Brunyes were delighting in the celebration and in each other. 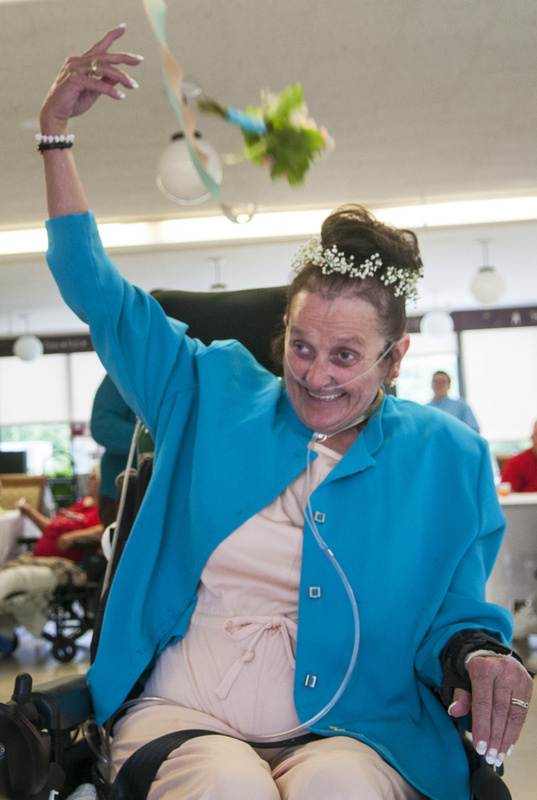 “It’s the happiest day of my life,” Sonya said.